Part of me feels a little embarrased putting this post up because you might think of me as your "typical white girl". I can assure though, that I'm not. In fact I hate Starbucks or any coffee for that matter. I don't own a pair of UGGS. And my mobile device is a Motrolla Droid, not an Iphone. I have however fallen under the trap of athleisure. It might be because I'm a college student and that's pretty much all that's around me. Or it might be that I just have a love for black and white, and that's trending right now. Who knows!!! Either way, while I still have that girl, classic style, every once in a while I like to throw on some sneakers and feel "hip". For some reason I feel like I blend in and "belong" more so than standing out in a floral dress and cute heels. I'll admit it; I'm not the most athletic person. However, if I'm wearing a hat and some sneakers, I can pretend I am. 1. Baseball caps have been my new best friend. I've always thought my boyfriend looks super hot in a golf hat. It just gave me an extra bit of sexiness. I bought him a white Calloway hat for Valentines Day last year, which inspired me to get me own hat. Instead, I bought a white Nike hat. Then that lead me to buying two more Nike hats, and a Chicago Cubs hat. If your hair is greasy, a baseball hat is your bestfriend. And if you're wanting to do a no-makeup kind of day, I think the accessory adds a nice touch. 3. I've been a fan of black and white sneakers long before they've become trendy. In middle school I wore black sneakers while everyone else had those bright neon ones....call me a trend setter! Last summer my go to outfit would be a cute blouse, shorts, and my black and white Nikes. It was so comfortable and so cute in my opinion. I'll definitely be rocking this look this summer as well. 4. Recently, I FINALLY hopped on the bandwagon of Adidas Superstars. Believe it or not, I've only worn them once, because I want to keep them in mint-condition. This summer though, I know I'm going to be busting them out with skirts and dresses. What are your athleisure must haves? Yes! I love a good-fitting pair of comfy yoga pants, and a cute pair of Nike's, too! I do love lacy bralettes! Last week, we had a photo shoot up in Traverse City and we were all in athlesuire wear because we all had a 4 hour drive back home afterwards! I'm sure it was incredibly comfy! I love lacey barrettes!! They are so cute and comfy. They add such a nice detail! I as well have been absolutely loving the athleisure trend as well! I've been sporting that look more frequently lately.. and can't get enough of it. It just looks so cute and comfy! Haha I absolutely love this ! I laughed so hard reading this, I am unfortunately the most quintessential white girl ever hahahaa.... ugh ! All of these pieces are amazing though, especially baseball caps... so good at hiding a horrid hair day haha <3 ! They're just too cute to not wear everyday! I do love my Nike Rosche trainers with a pair of skinny jeans! Such a good style. What you wrote made me laugh! I love everything athlesuire too. Its so comfy and always cute! Yes, Baseball caps are a must have! Love this post! Those sneakers are my fav :) I am so happy athleisure is in right now because it means I can dress comfy haha! I love a good pair of sneakers, Adidas! Very versatile and practical! It's really cute and so stylish! Baseball hats are definitely a life saver on a bad hair day! I love the athleisure trend - cute and comfy! I love that athleisure is becoming more popular as of late. Those sneakers look amazing and would be great for a wide range of looks too! I am starting to love athleisure look! They're so chic and comfy. Superstars were my jam in middle school. I love that they have come back. I need to get a new pair. I also love baseball hats. I wear them all the time on the weekends! I actually always wanted a pair in middle school, but my mom never bought me a pair :( At least I have a pair now! This sporty look is perfect! I am a big fan of Adidas! It matches almost with everything! I totally agree that a lacy bralette is necessary! They're just so dang cute! I'm loving athleisure too, mainly because it's a reason for me to dress comfortably haha! Sporty chic is definitely one of my favorite looks right now! I will definitely try using some of these pieces! I love everything here! The Nike ones are my favorites! Nothing wrong with some quality sportswear! I love how comfortable they are & you can pretty much wear it anywhere (people will just think you’re going to work out haha) & I love your picks here. I don’t have a cap yet, so thanks for the idea. I’ll have to add one to my sportluxe collection! I also love black and white sneakers! I have been obsessed with sportswear lately. One can never go wrong with sporty chic, on those days when dressing up is a struggle. Thanks so much for the inspiration and have an amazing Friday my darling. 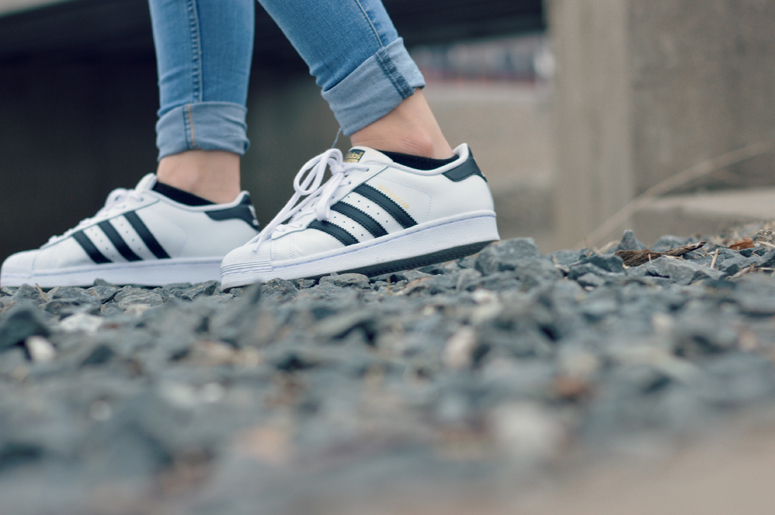 Love the sneaker picks, love a good athleisure look!